Neither I have criticise any religion and nor I have discriminated people on the line religion in my entire life- Techi Kaso, MLA, Itanagar. Neither I have criticise any religion and nor I have discriminated people on the line religion in my entire life, stated Itanagar MLA Techi Kaso. He was addressing a gathering on the occasion of Durga Puja celebration. He also appeal public to follow their religion without discrimination and disturbances to others. Kaso while attended Durga Puja celebration at Nirjuli and Naharlagun township today evening. He said that “Mano to Mein Ganga Maa hun, Na mano to bahta pani” . While addressing the devotees Kaso said that everyone have born to die but what you do will remain on this earth and will be remembered by others. 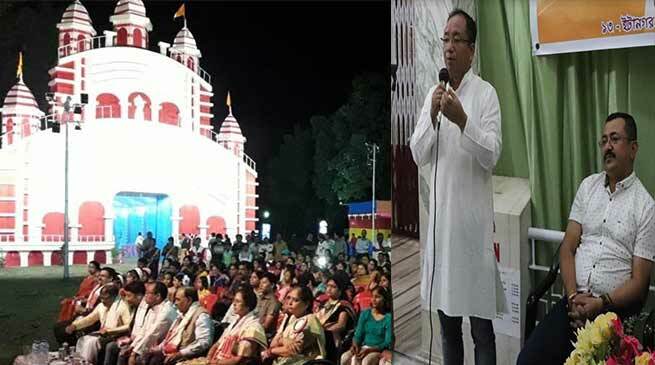 In NERIST campus Durga Puja pandal Kaso accompanied by former IMC deputy chief councillor Tarh Nachung and several youth leaders of the area attended the rituals and witness cultural programmes. While attending the programme at Kali Bari puja pandal at E Sector accompanied by senior citizens and local leaders of the area attended cultural activities and other rituals. Meanwhile Nachung also attended the Nirjuli Market Durga Puja Celebration at Nyikum Niya ground Nirjuli today. During the day the organizers also organised Kalash Yatra in the Nirjuli Township. In the Kalash yatra, hundreds of women devotees participated with religious fervour and gaiety.